Welcome to the Sylvan Squares website! Feel free to browse our website and learn more about us. If you have any questions, please check under Frequently Asked Questions and, if you cannot find your answer there, just fill out the form and your question will be answered as soon as possible. Guests: Graduation from a mainstream square dance club is necessary for following the large variety of calls. Contra dancing has similiar calls but does not adequately prepare you for square dancing. It gets you out of the house and with a group of friends and neighbors who are looking for laughter and enjoyment. Mistakes - and there can be many - are part of the fun because everyone, no matter the skill level or amount of experience, makes them. 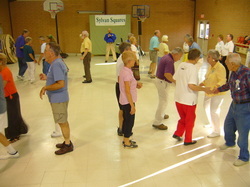 Opportunities to dance abound at Sylvan Squares, other clubs in WNC or almost anywhere around the world. Square dancing is not particularly physically challenging but it burns calories - 200 to 400 per half hour. It helps keep dancers mentally sharp, too, as it requires learning the basic calls through instruction and practice and how to follow the ever changing combinations of calls created by our callers. ﻿It is more than dancing!